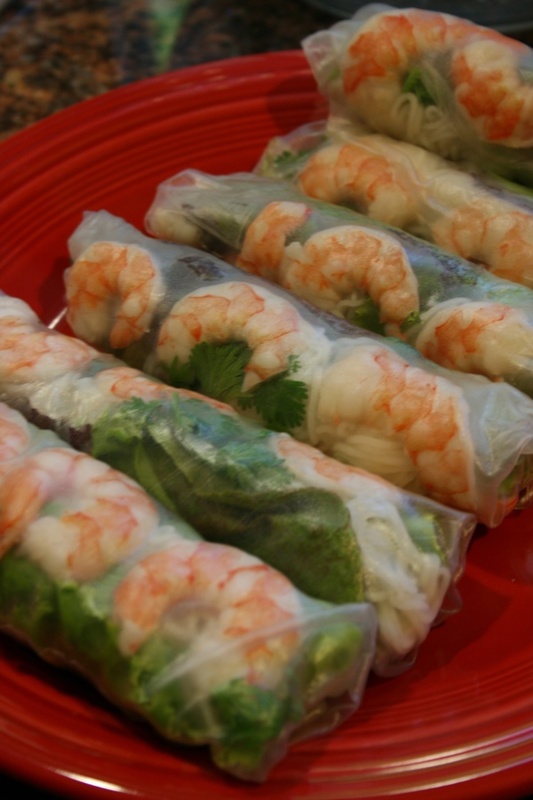 I am not going to tell you how to make Vietnamese Summer Rolls (gỏi cuổn). I’m still learning how to make them myself. 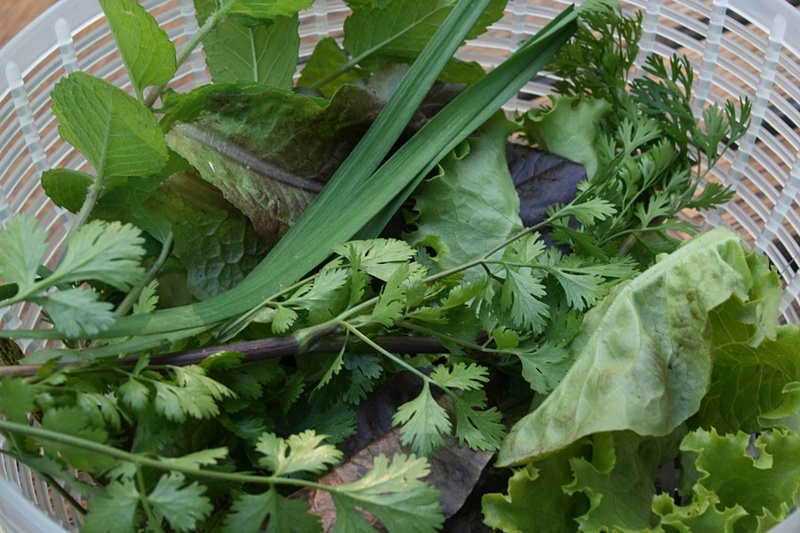 But nevertheless the the garden yielded up enough lettuce and herbs to make another practice batch on Thursday, the Cross Quarter Day marking the beginning of summer by some traditions. But I am going to point you in the direction of some people who actually do know how to make gỏi cuổn and then add a few pointers I’ve learned through trial and error. Until a couple of years ago, I never tried making gỏi cuổn at all. We could get them at so many Vietnamese restaurants and shops in northern Virginia that I didn’t think it was worth the effort. Then we moved to central Virginia. While it’s getting easier to find good Asian food here… well, it’s still not easy. With that knowledge, now you’re ready for my tips. Buy a brand of rice paper that has some tapioca starch in it. It seems to make the rice paper less fragile after dampening. Buy the right size of rice noodles for the filling. The ones I like best are labeled “rice vermicelli, medium”. I first used the very thin rice stick noodles and it didn’t work at all. Don’t soak the rice paper too much. You want to moisten it to where it starts to feel pliable, then set it aside on a damp dishtowel (smooth, not terrycloth) to further soften for a few minutes before you try to roll it up. Rolling these is an art. Too much filling and they’re hard to roll. Too little filling and they will seem doughy. Roll them too tightly and the rice paper wrapper will tear. Roll them too loosely and they’ll fall apart when you eat them. But they’ll still be edible. Don’t bother with the long leaves of garlic chives sticking out the end. I cut the garlic chives in smaller pieces – about 1 or 2 inch lengths – and add them with the rest of the herbs. Make more than you think you will need. Leave plenty of time to make them. More time than you think you will need. They’re really best when very freshly made. According to Andrea Nguyen in Into the Vietnamese Kitchen you can fill these with almost anything, only lettuce, rice noodles and hoisin/garlic sauce are requirements. And I would say that fresh herbs are also a requirement. I used various lettuce leaves, ‘Kentucky Colonel’ spearmint, volunteer coriander (already bolting), and garlic chives, (all from the garden); rice vermicelli and poached shrimp. The photo at the top of this post is the finished product. A note about coriander/cilantro: the flavor is best when it starts to make those feathery leaves which tells you it’s about to bolt (flower). You can cut it almost to the ground at this point and it will resprout to produce new leaves. And a note about the sauce. Mine is non-traditional, but we like it and think it compares favorably with many versions we’ve been served in restaurants. I mix approximately equal amounts of peanut butter and hoisin sauce, then add Thai Sriracha sauce and fish sauce to taste. 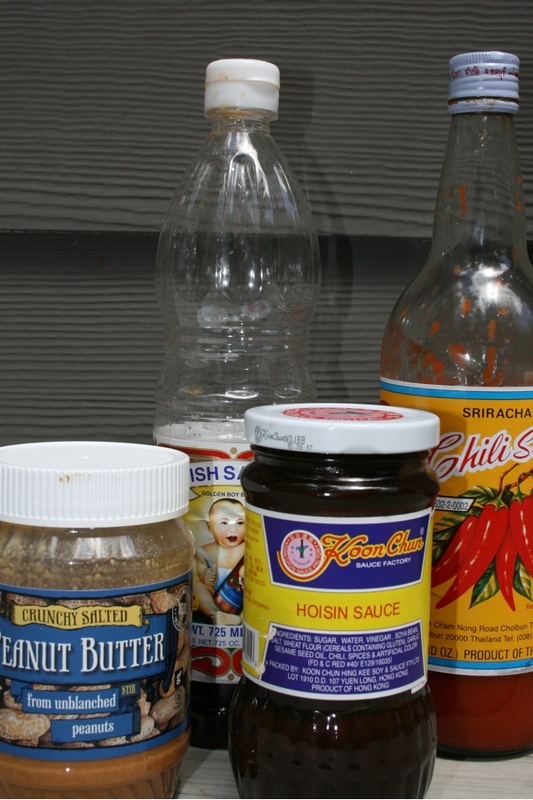 I’ve sometimes used light soy sauce in place of the fish sauce. At this point it will be quite thick, so add water to thin it to dipping consistency. 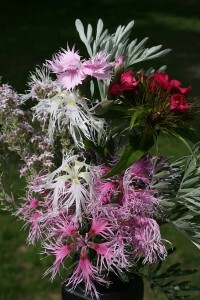 Then go out and snip a few flowers for the dinner table. No, not to eat. Just for pretty. My previous years’ investment in dianthus seeds is paying dividends now. This post is doing double-duty as a record of what we’re harvesting and eating from the garden, and for Week 2 of Wendy’s 2011 Garden-to-Table Challenge. I love your simple recipe for a sauce that sounds absolutely delicious. I’ll have to try that! I have just recently learn how to make this from my cousin. It really is good stuff especially if we have fresh vegetables and herbs for the ingredients. But I can never make it look nice when I roll it. Your rolls look so tempting and mouth-watering. Yummy!! I love summer rolls and yours looks delicious!